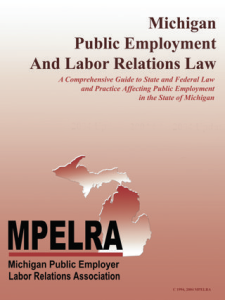 Welcome to the current version of Michigan Public Employment and Labor Relations Law, or as practitioners call it, the MPELRA Manual. The Manual sets the standard as the most comprehensive resource on Michigan Labor law ever compiled. This comprehensive text can only be found online and includes updated chapters from the 1994 and 2004 publications. Michigan public sector labor and employment statutes and regulations will also be at your fingertips. With over 1,700 pages of vital information, the Manual is an essential reference for public sector labor attorneys and practitioners, administrators, students, and other public sector professionals. Check out the MPELRA Manual Table of Contents, and you’ll wonder how you ever functioned without it! MPELRA MEMBER ACCESS: Beginning July 1, 2016, current MPELRA members, whose preponderant duties are to represent the interest of a governmental or nonprofit employer, receive login information after paying the membership fees. Click this LINK if you have forgotten your password. Please Contact Us if you continue to have any difficulty to logging in. NON-MEMBER ACCESS: Non-Members may purchase an annual subscription to the MPELRA manual for $200 per year. STUDENTS: Qualifying students may purchase a subscription for $80 annually or $40 per semester.